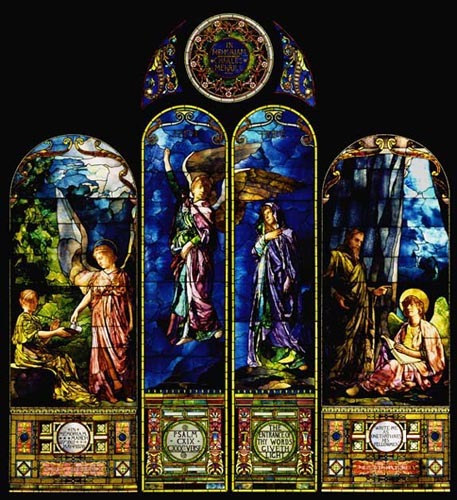 No discussion of Michigan's stained glass would be complete without mention of this month's featured windows, a series in opalescent glass depicting the themes of faith, hope, charity and brotherly love by John La Farge (1835-1910), one of the most significant innovators in the history of American stained glass. These windows, the only known La Farge stained glass in the state of Michigan, once adorned the First Unitarian Church of Detroit and now reside in the collections of the Detroit Institute of Arts. They not only are fine representations of La Farge's work, but they also highlight a problem faced when historic structures undergo renovations or demolition. Although it is not uncommon for stained glass windows to be separated from each other, sold and even discarded as their original buildings change hands or disappear, the happier resolution of this story is that these windows have remained together, preserved in the community for which they were created. In 1899 the First Unitarian Church of Detroit commissioned local architects Donaldson and Meier to design and build the congregation's second site. Since the 1850s the Unitarian church had been located in a building at the corner of Lafayette and Shelby. This new Romanesque revival style structure was built at the southeast corner of Woodward and Edmund. Eventually, the building was sold to the Church of Christ and the windows were removed when the widening of Woodward Avenue was planned in 1936, necessitating a modification and move of the church building. The windows were never reinstalled and ultimately all but one of La Farge's windows were donated to the Detroit Institute of Arts in 1959 by the Unitarian Church Trust. An additional La Farge window entitled "The Good Knight" (1899) did not remain with the other First Unitarian windows, and is currently in a private collection in Virginia. "The Good Knight" was thematically distinct from the other windows and was also completed and installed at a later date (the DIA dates the other windows from 1890). The DIA windows were restored between 1988 and 1991 by Mary Clerkin Higgins and were dedicated in April of 1991. The windows now in the collection of the Detroit Institute of Arts were memorial windows dedicated to three prominent Detroiters who served as trustees of the First Unitarian Church: Royal Clark Remick (1812-1878), Charles Merrill (1792-1872), and John Judson Bagley (1832-1881). The Remick window (far left), entitled "The Helping Angel," features an angel-representing Charity-pouring from a pitcher into the dish of a seated woman. Scholar Joyce K. Schiller notes that the image echoes another window La Farge produced for Unity Church in North Easton, MA. Indeed, this is one of a number of images that recur in La Farge's work, appearing in stained glass, watercolor studies and murals. The central grouping of windows (center left/right with rose window and tripointed pieces) was dedicated to Charles Merrill and features two lancets entitled "Faith" (center left) and "Hope" (center right). As with the Remick window, Schiller connects the subject matter of the ascending angel in "Faith" with another work, "Angel of the Resurrection," a window La Farge completed for the Thomas Crane Memorial Library in Quincy, MA in 1890. Similarly, the contemplative robe-draped figure of "Hope" is reminiscent of the "Adams Memorial"-executed by sculptor Augustus Saint-Gaudens-which La Farge designed to ornament the grave of Clover Adams, wife of his friend, writer Henry Adams. Although La Farge was Catholic, Eastern religious mysticism interested him, and he based his Adams Memorial on images of the Buddhist deity Kwan Yin (Kwannon). The inscription beneath "Hope" comes from Psalm 119, reading "THE ENTRANCE OF THY WORDS GIVETH LIGHT." Finally, the Bagley window (far right) represents brotherly love, but also has a literary theme, inscribed with the following excerpt from English poet Leigh Hunt's 1838 work "Abou Ben Adbem": "WRITE ME AS ONE THAT LOVES HIS FELLOW MEN." Reflecting the poetic inscription, the window portrays a standing male figure and seated angel writing in a book. The poem "Abou Ben Adbem" makes reference to non-Western religious imagery from the Koran, reflecting not only John Judson Bagley's literary tastes, but also La Farge's Orientalist artistic leanings and the Unitarian church's exploration of non-Christian religious views. In addition to his contributions to stained glass, La Farge's innovations in mural painting, Japanese-inspired watercolor and his decorative art collaborations with architects and other artists distinguished him as a man of multiple talents. La Farge also lectured and wrote prolifically on the subject of art, and is known for his friendships with many artists and intellectuals of his day. His contributions to stained glass technique include: The development and use of opalescent glass, which he first patented in 1880; incorporating molded glass embellishments into his creations, usually in the shapes of jewels or flowers; and plating, the layering of glass pieces directly on top of each other to achieve detailed depth and minimize the need for painting. There is some misunderstanding as to the extent of John La Farge's legacy in the medium of stained glass. Although La Farge was widely acknowledged in his time for his contributions to stained glass, many people today know little of La Farge and typically recognize the more prolific Louis Comfort Tiffany as the primary innovator in American stained glass. The two artists were contemporaries and later bitter rivals, simultaneously experimenting with the stained glass techniques that would revitalize and revolutionize the art form. The aim of the Michigan Stained Glass Census is not to privilege one artist or studio over another, but to acknowledge all of their contributions to the art form, and to Michigan's cultural heritage. Adams, Henry, et al. John La Farge (New York : Abbeville Press, 1987). Cortissoz, Royal. John La Farge (Boston: Houghton Mifflin Co., 1911). Pyne, Kathleen. Art and the Higher Life : Painting and Evolutionary Thought in Late Nineteenth-Century America (Austin, TX: University of Texas Press, 1996). Schiller, Joyce K. " A Deep Dream of Peace: John La Farge's Memorial Windows for the First Unitarian Church, Detroit," Bulletin of the Detroit Institute of Arts, Vol. 75 No. 2 (2001), 26-37. Sloan, Julie L. " The Rivalry Between Louis Comfort Tiffany and John La Farge" (1998). http://www.jlsloan.com/lct1.htm. Text by Michele Beltran, Michigan Stained Glass Census, May , 2002.